Working with plastic electrical boxes is somewhat different than using metal boxes. If you have worked with the older style metal boxes you are aware that their is a clamping mechanism that sits over the NM (as it is known in the electrical industry), Romex (which is a trade name) cables where they enter the box. This clamping arrangement secures or anchors the cable to the metal electrical box. With plastic boxes that is not the case. 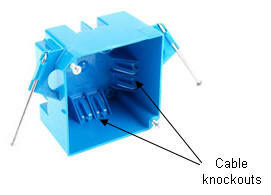 Plastic boxes have knockouts that provide a cable entry into the boxes, as shown in Figure 1. Figure 1 - Plastic electrical box showing cable knockouts. The cable, which would be clamped in position if it was a metal box, floats freely in the hole created by the knockout and is held in place by the staple or wire clamp that according to electrical code must be placed on the wire within 8 inches of the electrical box. Some people do not remove the knockout and only break three sides of the plastic. This creates a flap or door that, in most cases, will actually grab the cable if you try to remove it from the box. Others find that the flap is more of a nuisance than an aid. Do not use metal clad cables and plastic electrical boxes.